I love love love popcorn. It's definitely my "go to" savory treat. Watching my calories I try to satisfy most my cravings with the low-fat microwave kind...but every now and then when I really feel like indulging, I make the real stuff. You know...the old school on the stove kind. It's the only kind my mom made when we were growing up. Most the time I just use olive oil and a little sea salt, but when I really feel fancy I make this stuff. And it's always worth it! 1. In a large pot with a lid (at least 2 qt. ), or stock pot with a lid, add the olive oil and popcorn kernels. 2. Place the lid on the pot and put the pot over high heat. 3. 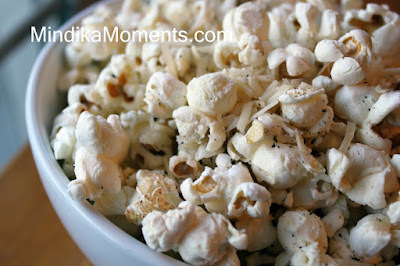 Allow to heat until the you start to hear sizzling and the popcorn start to pop, then reduce the heat to medium/high. 4. Watch the pot carefully and allow all the popcorn to pop. Once the popping slows down or stops, take the popcorn off the heat. Let it rest for about a minute (with lid on), then take the lid off and poor into a large bowl. You know I'm going to try this one! Popcorn is its own food group in my world. Ooohh, gourmet popcorn made in your very own kitchen. That just can't be beat.